20 pcs cages in one collection, at least 14 unique designs are ensured. Metal alloy with silver plated finish jewelry and craft charms. Please refer to product image for size details. Cages can fit in 6mm to 12mm beads respectively. You can use them as pearl cages to pair with your favorite beads, pearls or stone and chains to customize necklaces for yourself or your loved ones. You can also use them as essential oil diffuser locket to take your oils everywhere you go and indulge in your favorite aromas anytime, anywhere. Just add three or four drops of your favorite essential oil into the essential oil diffuser pom pom and dab the excess oil using a paper towel. The scent will last several hours or up to a few days depends on the strength and quality of your oil. Its stylish design instantly adds charm to any ensemble! It's fashion, creative, full of special means. Perfect and ingenious gifts for almost any holiday or special occasion. They will fit almost all chains. Assorted themes array of subjects and styles for all kinds of interests for parties or groups charms. 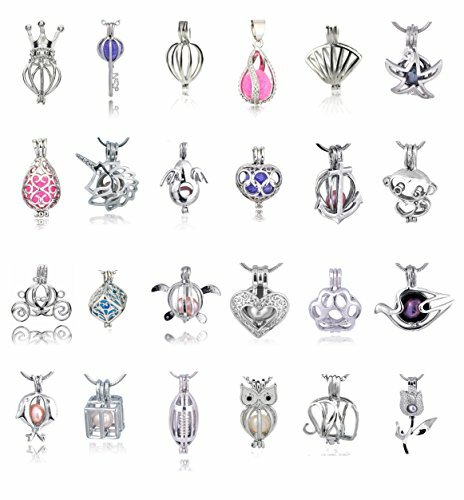 20 pieces unique design white gold plated pendants. There is NO DUPLICATE in one package. Take your oils everywhere you go and indulge in your favorite aromas anytime, anywhere. The scent will last several hours or up to a few days depends on the strength and quality of your oil. Perfect Christmas gift for making pearl cage pendant charm necklace. Free clear lock organizer which is ideal to store your small accessories. Comes with 20 pieces free colorful essential oil diffuser cotton pom poms. If you have any questions about this product by CHERRI WAVE, contact us by completing and submitting the form below. If you are looking for a specif part number, please include it with your message.